The National Heritage Museum has an interesting temporary exhibit detailing migration patterns of African Americans. The first room is very sobering with reward notices for runaway slaves and also notices of slaves for sale. In other rooms the great migration of African Americans from the South to the North from 1900-1930 was shown in photographs. Most of the exhibit consists of photos. Another section was devoted to the Haitian immigration and recent immigrants from Sub Saharan Africa. Finally the recent reverse migration from the North back to the South is shown. Statistics of African Americans migrating are in evidence throughout the exhibit space. The information presented is limited, but it is such a vast subject. A mostly positive spin on contemporary African American experiences is clear. The Museum is operated by the Scottish Rite Free Masons and is always free. It is located in Lexington on a large plot of property that is also a headquarters for the masons. The gift store has books about masonry and the library and archives are open to the public and researchers. I had imagined that they were extremely secretive, but I was given a very cordial welcome and invited to search the online catalog. They had a nice exhibit of old books about masonry and maps of the United States. I need to return to Lexington soon and see the rest of the museum. Many years ago they had a wonderful exhibit about the Buffalo Soldiers. The Sterling and Francine Clark Institute in Williamstown, MA has a wonderful collection of nineteenth century French art. Among its riches are many oils by Renoir in a large room of impressionist paintings. In other galleries are some of John Singer Sargent's and Winslow Homer's best work. Nearby is the Williams College Museum of Art that is purported to also have an excellent collection. Edith Wharton, the Pulitzer Prize winning author, left Newport, Rhode Island at the end of the 19th century and built a house called The Mount in the Berkshires. It was a writer's retreat and she never had more than five visitors at one time. That was such a contrast to the grandiloquent parties in Newport in the summer. Her first book was about architecture and interior design. Major restoration on the house began in 1999. It is a work in progress and will cost 25 million dollars to complete. Boston area families have contributed millions towards the project. Since there have alreay been several frosts in the Berkshires the gardens were not at their best. Much of the interior on the third floor was barren. Yet our guide did a fantastic job of telling the story of Edith Wharton's life and her accomplishments. We arrived at Chesterwood at closing time and the staff and guide were so welcoming and gracious that we were still given a tour of Daniel Chester French's house and sculpture studio. Afterwards cookies and hot drinks were waiting for our tour group. As we pulled away we had a beautiful sunset that reminded me of a painting of Prout's Neck at West Point by Homer that I had seen a few hours before at the Clark Institute. The tour organizers could not have been more gracious and kind. The Lexington History Society offers tours of three local buildings all important in 1775 when fighting began between the colonists and the British regulars. The Buckman Tavern housed many men from area militias on the night of April 18th of that year. It is historically significant but few objects are original to the Tavern in 1775. There is some interesting artwork and the actual front door that was hit by a bullet from the battle the ensuing morning. But by far more interesting is the Hancock-Clarke House less than a quarter mile away. It has a small museum of objects relating to the Battle of Lexington and Concord, and a vest owned by John Hancock. It was the parsonage of the grandfather of John Hancock and of Jonas Clarke who was the town reverend in 1775. On the evening of April 18, 1775 John Hancock and Sam Adams were hiding from the British regulars in this house. Many of the objects there now are original to the house and that period. Since the minister was the most educated man in town and one of the wealthier, the house is very nicely furnished. 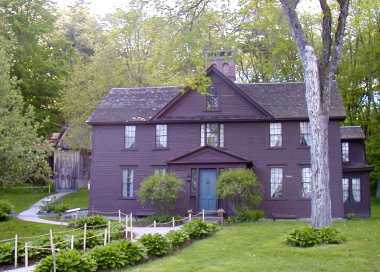 The house was the destination of Paul Revere and William Dawes on the midnight ride. Our guide explained it very well. She was very sweet and patient with our questions and comments. On my next trip to Lexington I would like to see the Historical Society's third property, the Munroe Tavern, as well as the The National Heritage Museum , which is owned and operated by the Free Masons. The oldest parts of the Wayside House in Concord, MA, were constructed in the late 17th century. It was inhabited by the Bronson Alcott family and was the only home that Nathaniel Hawthorne ever owned. Later it was purchased by the Lothrop family. Mr. Lothrop owned a publishing house in Boston and the wife was a distinguished author of children's books. The history of the house, the people who lived in it, and their relationship to major events in American history are clearly explained in an exhibit in the barn, which is adjacent to the the Wayside. 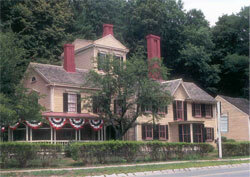 The house is operated by the National Park Service and part of the Minuteman National Historic Park . The ranger had decades of experience and gave a very clear and complete tour. He was clearly a seasoned professional. It is in a bit better condition than the Ralph Waldo Emerson House but it made me wish that our government would spend more on the Park Service. Several years ago the Longfellow House in Cambridge, MA was renovated, and it looks great. Unfortunately many historic house museums are getting fewer visitors than in years past. Several decades ago many of the major museums in Boston and New York City were free. In the last few years entrance fees have been skyrocketing with the Museum of Modern Art in NYC setting the bar even higher with a $20 entrance fee. Many major Boston Museums such as the Museum of Fine Arts , the Museum of Science , and the New England Aquarium now charge $15 or more. Yet the McMullen Museum at Boston College features some excellent exhibits and is still free! Past exhibits have included Caravaggio, Edvard Munch, and Jewish Women and their Salons. It is less than a ten minute walk from the terminus of the B Green Line T.
The current exhibit made my jaw drop and I remained astounded for the next hour. Cosmophilia: Islamic Art from the David Collection, Copenhagen, is a truly astounding exhibit. Luckily for Boston College, and the University of Chicago where the exhibit will travel next, the building that houses The David Collection is undergoing a year long renovation. The Danish Museum allowed The McMullen to pick and chose from their large collection for display in Boston. The result is an amazing diversity of mediums, styles, and textures, but all of the work is beautiful and of tremendous workmanship. Glass, wood, ivory, silver, gold, parchment, ceramics, leather, silk, the list of materials used is so extensive. Representations of people, animals, floral motifs, geometric designs, and of course calligraphy abound with a section of hybrids of more than one style. The Sackler Museum at Harvard often has outstanding exhibits of Islamic Arts such as the recent drawings in the Tablet and the Pen, but I have never seen such a diverse exhibit there. The McMullen has it all from a giant carpet to a small vessel for spreading rosewater. Islamic Art has never been a favorite of mine, but this exhibit is a must see. Took another day trip to Concord, MA to see Orchard House where Louisa May Alcott wrote Little Women. The leaves are beginning to change and the walk there was very enjoyable. The employees were very welcoming and the grounds were nicely kept. The visit started in the building where Bronson Alcott, Louisa May's father, held philosophical discussion groups. He was one of the leaders of the transcendentalist movement, and also a man who struggled financially for decades. In later years proceeds from Louisa May Alcott's writing helped to support the family. The docent was young and did an outstanding job at the Orchard House. First she asked for a show of hands of those who had read the book Little Women. Some of us had not. So her tour made references to the book that were easy to follow. Her explanations were clear and concise. She also showed some feeling for the Alcotts and their belief systems. As on any good tour she had amusing anecdotes such as the origin of the phrase "Pop goes the weasel." It comes from a device called a weasel that twirls yarn and compresses with a loud pop at the end. There were many visitors for a Monday in early October. The whole experience was very pleasant. The guide helped me find the postcards that I wanted to purchase in the store. Concord is such a friendly place to visit. This morning I encountered several walkers who all smiled and said "hello." 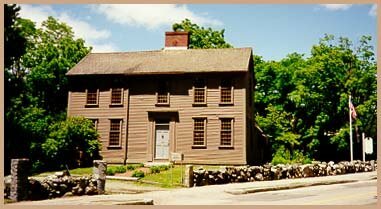 Someday I hope to take a tour of the Wayside where Louisa May Alcott and later Nathaniel Hawthorne and his wife Sophia lived.